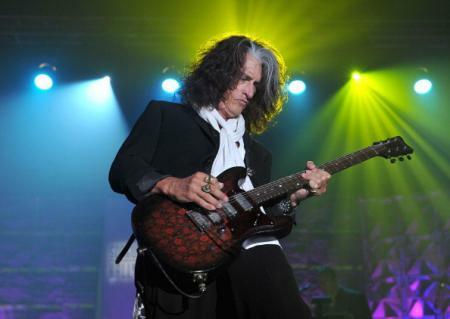 Joe Perry Net Worth 2018: Hidden Facts You Need To Know! Classic Rock Roll of Honour: Presented by Orange Amplification 2014 TV Movie performer: "La Grange"
Howard Stern Birthday Bash 2014 Video writer: "Walk This Way"
Need for Speed 2014 writer: "Back In The Saddle"
The Smurfs 2011 writer: "Walk This Way"
Ruisrock - 40 vuotta rockia ja rakkautta 2011 TV Movie documentary writer: "Walk This Way"
What About Boys? 2010 Short writer: "Dude Looks Like a Lady"
The Fighter 2010/I writer: "Back In The Saddle"
Everything Is Terrible: The Movie 2009 Video writer: "Walk This Way"
Chris Botti in Boston 2009 TV Movie writer: "Cryin'"
Elvis: Viva Las Vegas 2007 TV Movie documentary performer: "Mystery Train"
Karaoke Revolution Party 2005 Video Game "Crazy"
Aerosmith: Rockin' the Joint - Live at the Hard Rock Hotel, Las Vegas 2005 Video documentary short writer: "No More No More", "Draw the Line"
Be Cool 2005 writer: "Cryin'"
Garth Brooks Live Coast to Coast: Los Angeles 2001 TV Special writer: "The Fever"
Super Bowl XXXV Halftime Show 2001 TV Movie writer: "Walk This Way"
Dogtown and Z-Boys 2001 Documentary writer: "Toys in the Attic"
Run-DMC: Together Forever - Greatest Hits 1983-2000 2000 Video performer: "Walk This Way"
Charlie's Angels 2000 producer: "Angel's Eye" / writer: "Angel's Eye"
Shanghai Noon 2000 producer: "Back in the Saddle Again" / writer: "Back in the Saddle Again"
Armageddon 1998 writer: "What Kind of Love Are You On"
Garth Brooks: Ireland and Back 1998 TV Movie documentary writer: "The Fever"
Garth Live from Central Park 1997 TV Movie documentary writer: "The Fever"
Rock and Roll Hall of Fame Induction Ceremony 1995 TV Movie performer: "Train Kept a-Rollin'", "For Your Love", "Bring It On Home", "Prison Blues", "Gamblers Blues", "Baby, Please Don't Go"
It's Pat 1994 writer: "Dude Looks Like a Lady"
Ace Ventura: Pet Detective 1994 writer: "LINE UP"
Aerosmith: Crazy 1994 Video short writer: "Crazy"
Wayne's World 2 1993 Live version, "DUDE LOOKS LIKE A LADY ", "SHUT UP AND DANCE Live Version"
Mrs. Doubtfire 1993 writer: "Dude Looks Like A Lady"
Raw Power 1990 TV Series writer: "Love in an Elevator"
Say Anything... 1989 writer: "Back In The Saddle"
Like Father Like Son 1987 writer: " Dude Looks Like a Lady"
China Girl 1987 writer: "Walk This Way"
The Lost Boys 1987 writer: "Walk This Way"
Rock Around the Dock 1986 TV Movie writer: "Walk This Way"
Run-DMC: Together Forever - Greatest Hits 1983-2000 2000 Video composer: song "Walk This Way"